Yesterday I shared my tips for enjoying your time in an ugly home by enhancing the spaces you love. If your situation is anything like mine was (renting a furnished apartment decorated by someone with extremely different taste from my own), enhancing a few nice things isn’t quite enough. Today I’ll share how I disguised the ugly elements by camouflaging, covering and cheating! The apartment had a working fireplace, but the mantle was a plain piece of unstained wood. It held a large painting that belonged to the landlord (which they refused to remove). I just worked around it, layering the things I loved in front of it. Sometimes I put various table runners up on the mantle to soften it. 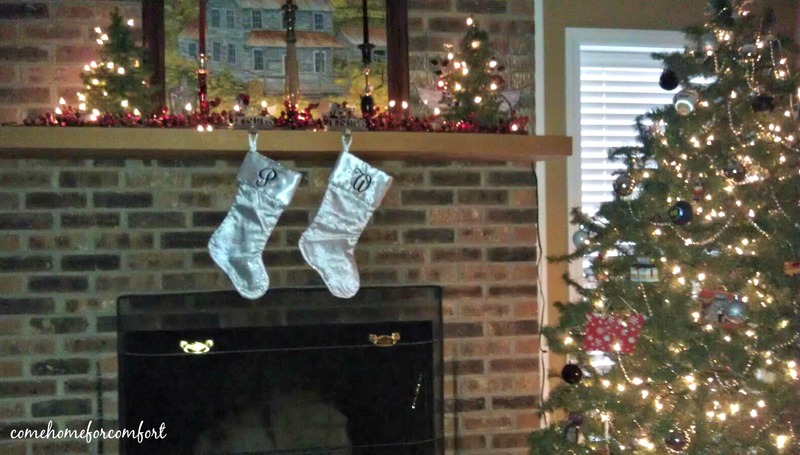 Here’s what I did at Christmas – a berry garland and white lights helped to warm up the mantle. I understand that the rough wood and the rustic picture could really work with a “cozy cabin” decor – but that’s not what I had. The orange and brown clashed with things I already had. It was a temporary living situation, so I worked with it! I pulled this pic from Facebook…please excuse the quality! I mentioned the hideous 1995 era floral couches yesterday – those each got a slipcover I purchased at Big Lots for around $30. Before I found the slip covers, I used extra quilts and throws to hide the pattern. Those slipcovers were a great investment! Being a basement apartment, there was a serious lack of windows. I was inspired by the picture below, and with my mom’s help was able to recreate this look on a large blank wall. It really made up for the lack of windows and was a great focal point in the room. I hope these posts have been helpful for any of you enduring a stay in an ugly place! If you have any tips to add, I’d love to hear them!